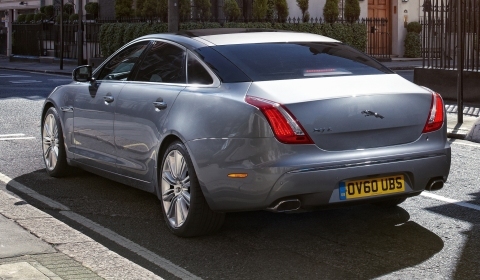 The XJL Supersport is the extended wheel base version of Jaguar’s excellent XJ platform. Having reviewed Jaguar’s excellent XJ before, the XJL Supersport is the natural next step up. It’s the top of the range model, geared towards performance but with added legroom for those that prefer to be chauffeured. We got five days with the car and a variety of different experiences! 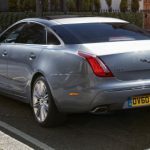 Looking at the XJL Supersport, it’s difficult to tell it apart from the rest of the Jaguar XJ range. Badges are limited to the grille. A simple XJL badge at the back identifies the range topping model but does not reveal its potential. Even the exhaust pipes give nothing away. That is until you hit the start button. At which point, it is undoubtedly the Supersport model. 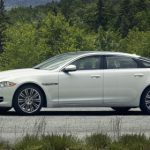 The XJL Supersport features the same supercharged 5.0 liter V8 power plant fitted to all of Jaguar’s performance models. In the XJL Supersport it produces 510hp and 625Nm of torque. The full 510hp only arrives between 6,000rpm and 6,500rpm, immediately after the torque runs out. It means that you get a nice push up to the 6,000rpm mark, then a period of sledgehammer performance. Overall though, at cruising speeds the engine is very refined. Set the adaptive cruise control and you often forget how potent the performance really is. The V8 rumble is faint and blends into the wind noise, imposing only slightly more on your journey than the 3.0 liter diesel equivilent. Yet, depress the throttle for an overtaking manoeuvre and that V8 rumble instantly breaks through once more. 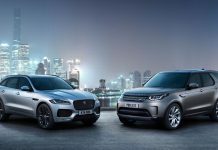 Coupled to the V8 engine, Jaguar offers an eight-speed automatic gearbox, controlled through the usual Jaguar drive selector. It’s a circular control located on the central transmission tunnel. As you push the start button it rises from the fascia. To select drive you have to scroll from left to right, through neutral and reverse. The gearbox itself has two different modes, a standard automatic mode that aims to optimise fuel economy and a sport mode that aims to keep the gearbox in the optimum gear for performance. You notice subtle differences in performance with both programs. If you want a pure manual experience, an extra dynamic mode, located below the shifter completely overrides the automatic shifts. Shifting through the automatic mode is as smooth as you would expect from a brand of Jaguar’s finese. The changes are seemless at lower speeds and wafting on motorways and through the town is relaxed and seemless. Push on a little though and you start to feel the changes more. In Sport mode, the sudden shift from one gear to the next is more obvious, although still very composed and smooth. The power plant is only a portion of the Jaguar story though. 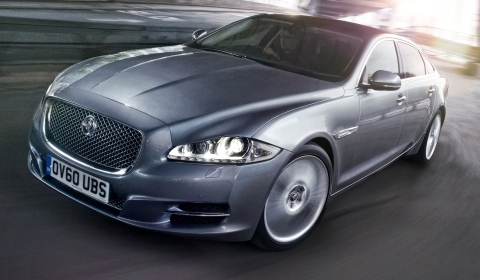 The XJ features an innovative all-aluminum platform that reduces weight and improves handling. At 1,870kg, the XJL feels particularly light, perhaps helped by accurate steering. The weight balance also helps, splitting the load 49/51, front/rear. With the power coming from the rear, it feels almost perfect. Given that our test car was the XJL, with a wheel base extended by 125mm, the driving feel comes as a surprise. Jaguar are definitely pitching the Supersport towards a different audience. 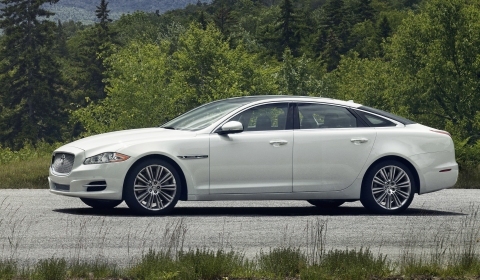 Whereas the 3.0 liter XJ feels smooth and composed, the Supersport has a very firm ride. It bounces over poor road surfaces, always feeling stiffer than a luxury limousine probably should. The ride therefore makes it less of a car to be chauffeured in, which might detract corporate buyers. Yet what they loose, those interested in the pure driving experience gain! The suspension is firm for a reason and, having experienced the XJL Supersport on a track, we can confirm that the Supersport rides excellently when pushing the pace. Travelling through country lanes, it’s easy to get carried away with the blend of excellent ride and blistering performance. What you lose in wafting ability, you gain in sheer hooning pleasure. Despite the Supersport’s excellent driving characteristics, the traction control remains a big feature of the driving experience. In Sport mode, with the dynamic mode enabled, the electronic systems are still very noticeable. To completely remove the system, you need to engage a separate button, located above and to the right of dynamic mode. Of course, most people won’t even touch that button, but if you do, expect wheel spin to be plentiful. 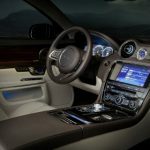 Another aspect of the Jaguar brand that must be discussed is the renewed focus on luxury and quality interiors. Nothing demonstrates this better than the XJL Supersport’s interior. It is a pretty special place to be. Black perforated leather lines the seats with matching piano black fascia panels and carbon fiber accented trim. 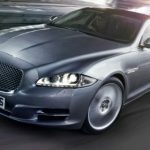 Being the 2013 model, the XJL now comes fitted with a Meridian sound system as opposed to the discontinued Bowers and Wilkins model. The navigation system is okay, if a little more difficult to use than certain other systems. It’s luxury all the way through. The glove boxes are lined with a vivid blue suede, the rear seats get fold up tables and the rear windows all come fitted with sun shields. The media system fitted to the rear headrests wasn’t the greatest system we’ve seen before. The remote is located in the central arm rest and splits the channels between right and left. The controls take some getting used to, perhaps if we had more time we might grow to understand it better. By now, you’ve probably noticed that photos we’ve used to show off the Supersport are taken directly from Jaguar’s media database. The reason? We actually clocked up a fair few miles with the Supersport. It served as our mode of transport for the Goodwood Revival this year so we managed a variety of different roads for the few days of our trip. In truth, it was the perfect companion. Despite problems navigating the high-rise car parks at Heathrow’s Terminal 3 short stay car park (it takes several attempts to get it round the tight kerbs), it actually performs well in all situations and can be economical if driven with a light right foot. But by far, the best situation to find yourself in a Jaguar XJL Supersport is driving on a twisty road on a sunny day pushing the pace a little bit and enjoying the awesome driving dynamics.